Following a recent 5 day visit, we decided to write a travel guide to the top things to do in Huntsville Alabama. 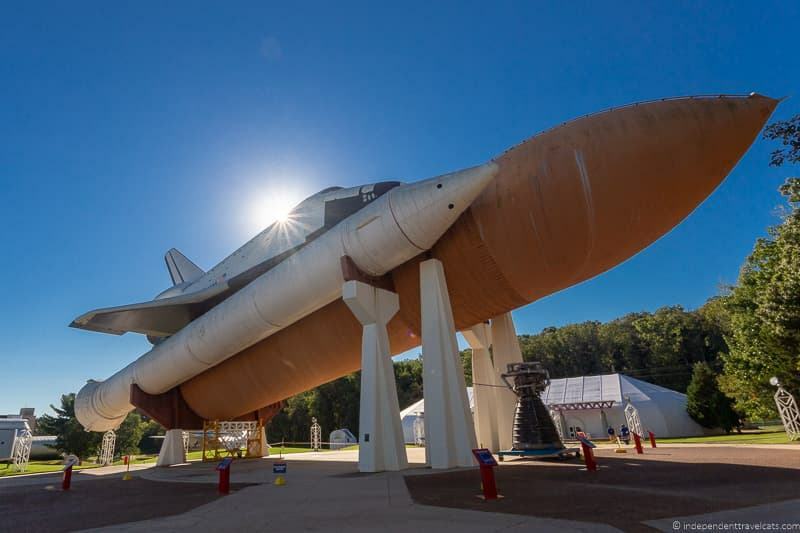 Although Huntsville is best known for its space-related attractions, we discovered that there is much more to see in this city than rockets and space shuttles (although rockets are awesome!). Huntsville is a city in northern Alabama that initially grew because of its cotton and railroad industries, but today it is best known for its military technology and aerospace industries. It was here that scientists designed and tested the Saturn V rocket that would send men to the moon for the first time. Today, the city is full of rocket scientists and NASA’s Marshall Space Flight Center continues to be at the forefront of U.S. rocketry research and construction, earning Huntsville its nickname “Rocket City”. Huntsville’s top visitor attraction is definitely the excellent U.S. Space and Rocket Center and it is also well-known as being the home of Space Camp. However, there is more than just space-related attractions to see here. Huntsville offers a range of cultural, historical, and culinary attractions, which include an excellent art museum, several quirky dining and entertainment venues, lush botanical gardens, three historical districts, regular arts performances, and a thriving craft beer scene. There are plenty of things do in Huntsville and you can easily spend a few days here. Whether you have 3 hours or 3 days here, we’ll provide advice on how to get to Huntsville, where to stay, what to eat, and what to do in Huntsville. We share our list of the top things to do in Huntsville as well as some day trip ideas for those who have more time. Best time of year to visit Huntsville? How many days should I stay in Huntsville? Where to Stay in Huntsville Alabama? Where to Eat in Huntsville? Where to find more information on Huntsville? 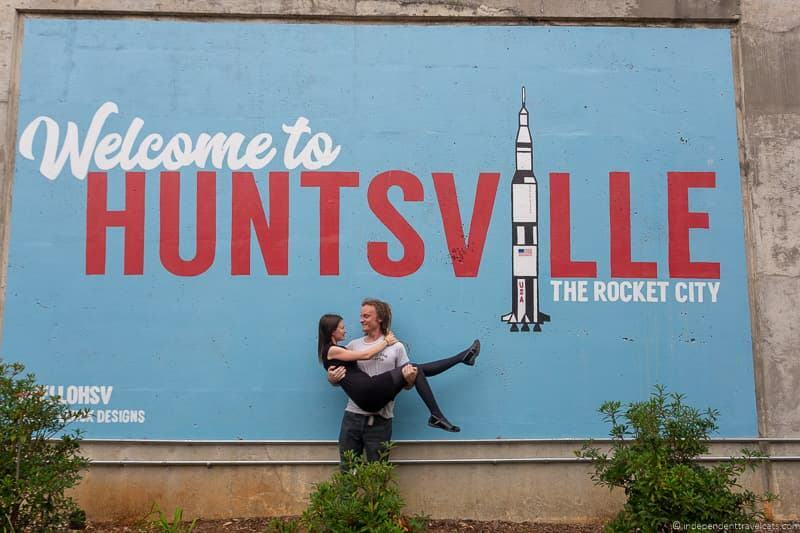 Before we dive into the details of our favorite things to do in Huntsville, we wanted to give you some practical information to help you plan your own trip to Huntsville. Huntsville is in the far north of Alabama in the United States of America, and sits just north of the Tennessee River. It’s around 100 miles north of Birmingham Alabama and 100 miles southwest of Chattanooga Tennessee. There are several ways to get to Huntsville Alabama. Huntsville International Airport is the closest airport and it offers multiple flights connections within the United States. Many international flights connect through Atlanta, Georgia which is a large international hub. The airport is a 15 minute drive, taxi or shuttle ride from downtown Huntsville. Huntsville doesn’t have a train station, but the cities of Birmingham and Anniston to the south and Nashville to the north do, so you can take an Amtrak to these cities. Then you can either hire a car or take a bus to reach Huntsville. You can see Amtrak schedules and routes here. Greyhound services operate to and from Huntsville from cities around the USA, so bus is definitely an option for getting to Huntsville. You can check the bus schedule for Huntsville here. If you are in the USA, driving is definitely a great option for getting to Huntsville. Interstate 65 runs right past the city in a north/ south direction, linking the city to Birmingham in the south and Nashville in the north. Atlanta and Memphis are also within a 3.5 hour drive of Huntsville. If you are thinking about renting a car, you can check Enterprise rates here. There are a number of options for getting around Huntsville. The easiest option is definitely by car, parking is both excellent value and widely available, and this will be the easiest way to get between the downtown sites and those attractions which are further afield. Public transit options are not great here, but there is a shuttle bus system which runs Monday through Friday from 6am to 6pm, with a number of routes covering much of the city. There is a bike sharing program in downtown Huntsville which is operated by Pace. There are also of course taxi and ride sharing options, including Uber and Lyft. Huntsville is a good city to visit year round. It really depends what you want to do and see in the city. For example if you are coming for Panoply Arts Festival, it normally takes place at the end of April. It does get quite hot in the summer months, especially June through September. The summer months are also the most popular times to visit, so you will find it to be generally more expensive and there will be more visitors in the city in July and August. 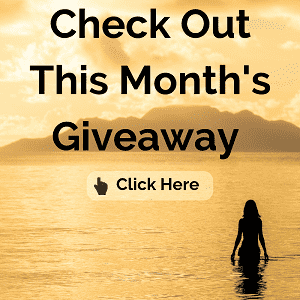 Our suggestion would be to try and visit during the shoulder months if you can: March through May or September through November. You should get the best balance in terms of weather, visitor numbers, and prices. We suggest you spend at least two of three days in Huntsville to see all the highlights. It makes for a great long weekend destination. As you’ll see when you dive into our guide to things to do in Huntsville, there’s a lot to see and do in Huntsville, enough to fill several days! Huntsville has a wide range of lodging options to choose from across the city, with a particularly good selection of 3-star hotels. Note that, as far as we know, there are no 5-star hotels or hostels located within Huntsville. Drury Inn and Suites – This 3-star hotel was where we stayed when we visited Huntsville. The hotel offers a good cooked breakfast, comfortable rooms, business center, indoor pool, fitness center, and complimentary evening food and drinks. This is a great good-value stay located right across from the U.S. Space and Rocket Center. Highly recommend. 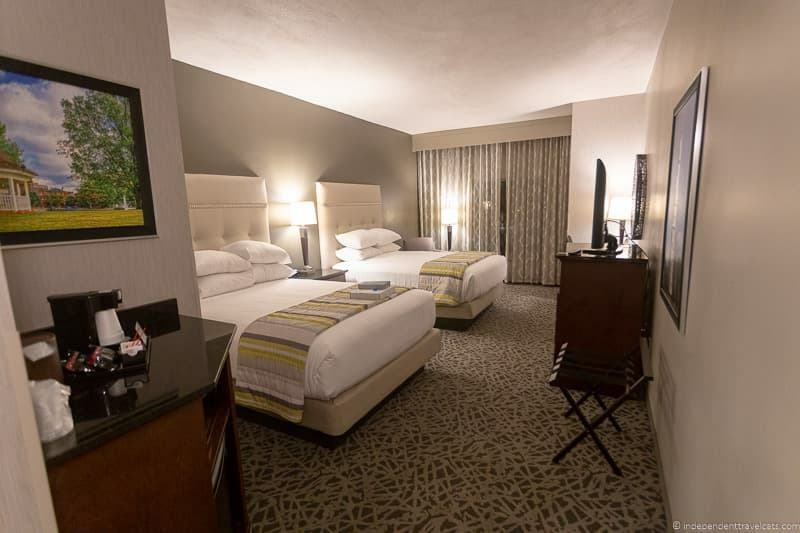 The Westin Huntsville – This 4-star hotel is a well rated high-end downtown hotel with everything you need for a comfortable stay including an indoor and outdoor pool, fitness center, business center, on-site bar and restaurant, free parking, and room service. The Clarion Inn Huntsville – A great value option 3-star option offers an outdoor pool, fridge/microwaves in each room, breakfast, free parking, and fitness center. A 10 minutes drive from downtown Huntsville and the U.S. Space and Rocket Center. La Quinta Huntsville – This 2-star property offers an outdoor pool, continental breakfast, flat screen TVs, free parking, and is pet friendly. This hotel is a good option for those on a tighter budget. Located 2 miles from the U.S. Space and Rocket Center. Airbnb is a good option if you are seeking a room or apartment in Huntsville, you can check local listings here. If you haven’t used Airbnb before, you can sign up and get up to $30 off your first booking here. 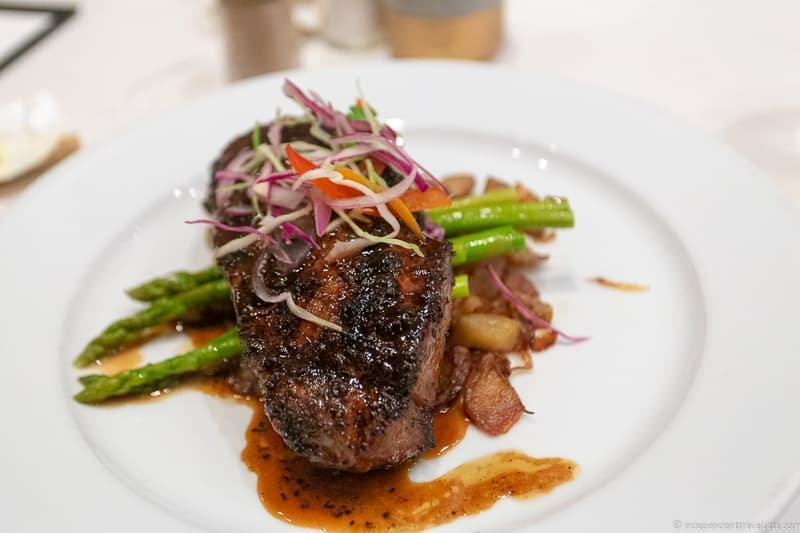 There are a lot of dining options in Huntsville from casual bar food to fine dining so you are sure to find options that will suit! Pints and Pixels – A casual pub restaurant offering a wide selection of pub food, craft beers, and a full bar, along with over 50 vintage operating arcade and pinball machines. These include all the classics like Pac-Man, Donkey Kong, Mario Bros., Frogger, Street Fighter, Space Invaders, and Mario Kart. A perfect place for any arcade lover. Commerce Kitchen – Opened in 2010 by Chef James Boyce, this popular downtown restaurant features classic American dishes with Southern influences. Reservations recommended. AM Booth’s Lumberyard – A unique sprawling entertainment venue with a variety of drinking and dining options that include a bar, patios, bistro-style sit-down restaurant, and family-style dining on a beautifully restored Pullman train carriage (the Blue Bayou). It has a laid back atmosphere and there is usually live music on one of more of its many entertainment stages. Reservations needed for the Blue Bayou train experience. 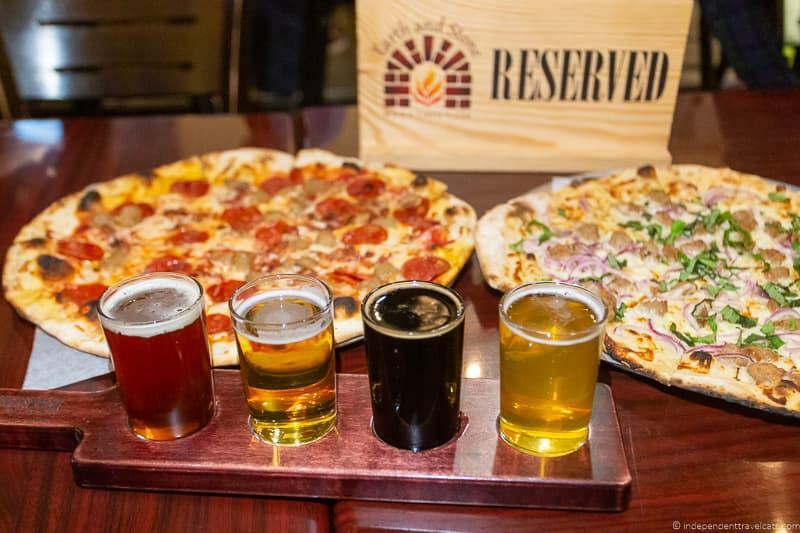 Earth and Stone Wood Fired Pizza – Fantastic pizzeria with loads of wood-fired pizza options, and also serves local craft beer and homemade ice creams. Located in Campus 805 as well as in the nearby town of Madison, AL. Toybox Bistro – This unique casual eatery serves large portions of American classics and some dishes of its own creation. The store is decorated with a large collection of nerdy memorabilia, which include Star Wars, Transformers, Star Trek, Pokemon, Legos, and classic board games. Blue Plate Cafe – Opened in 2003, this American diner spot serves all the classic American comfort food dishes for breakfast, lunch, and dinner. It is particularly popular for breakfast, and portions here are huge so come hungry! 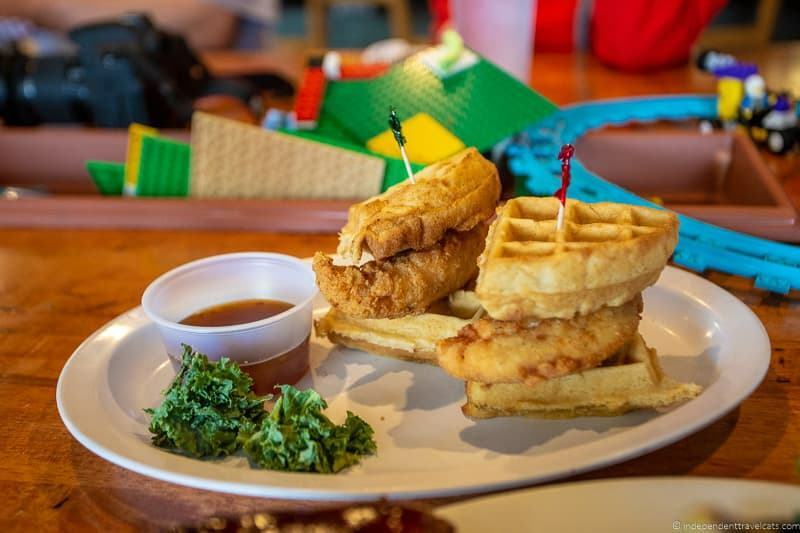 G’s Country Kitchen – This casual down-to-earth eatery offers home-style Southern favorites and soul food such as fried chicken, catfish, pork chops, meatloaf, and burgers. A local favorite hidden away in the Oakwood Shopping Center. 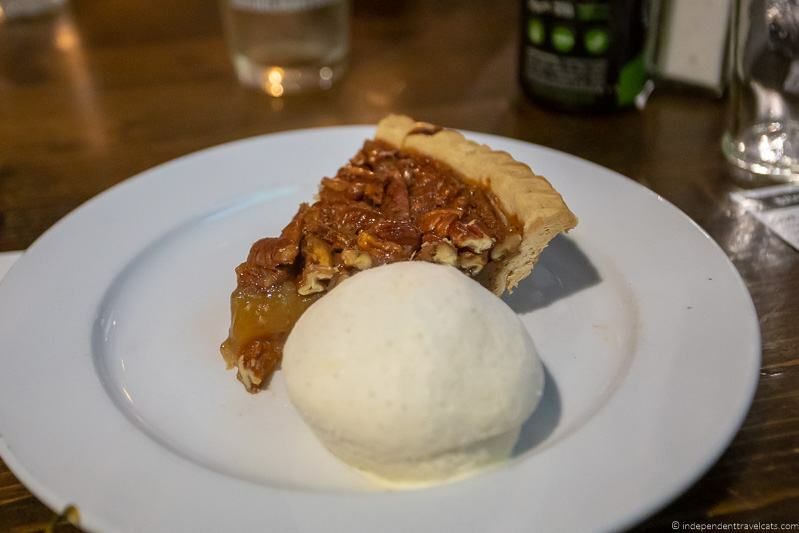 1892 East – A restaurant in Huntsville’s Five Points Historic District that focuses on New American cuisine made with local and seasonal ingredients. Serves upscale food in a down-to-earth tavern like setting. Lots of vegetarian dishes. Reservations recommended. Cotton Row – Upscale fine dining restaurant with full bar serving classic Modern American cuisine with Southern influences in a historic 1821. First restaurant opened by Chef James Boyce in Huntsville. Reservations recommended. Honest Coffee – Popular cafe serving delicious locally roasted coffee along with a good selection of cafe-style snacks, baked good, and açaí bowls. Part of a local regional chain based in Franklin, TN. 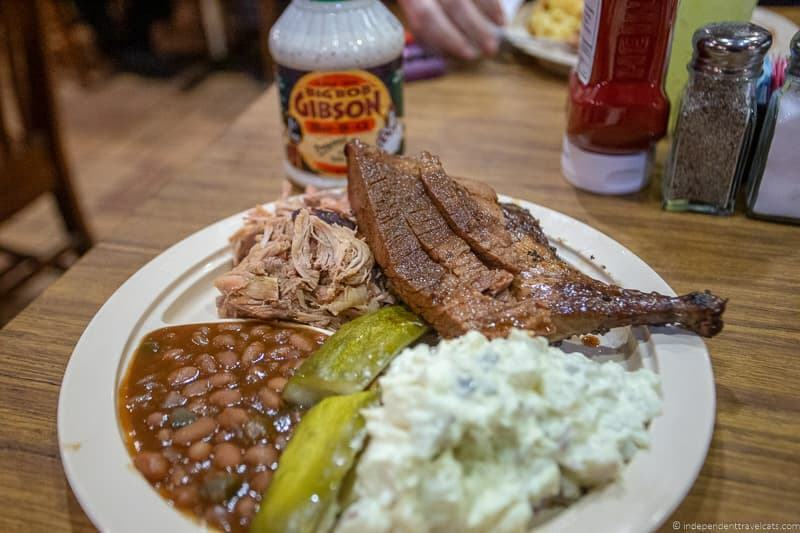 Big Bob Gibson Bar-B-Q – Big Bob Gibson’s is the most famous BBQ place in Alabama, but it is located about 25 miles southwest of Huntsville in Decatur, AL. But if you are a Southern BBQ fan, this will likely be worth the detour as it has won lots of prestigious barbecue awards. What began as a backyard BBQ joint started by railway worker Bob Gibson in the 1920’s has become world famous. Be sure to try the unique tangy white sauce. For more information about what to do in Huntsville, check out the Huntsville Visitors and Convention Bureau website, which has loads of information to help you plan your trip. Once you are in Huntsville, we recommend that you stop by one of the visitor centers for advice, free maps and brochures, coupons, and local event information. There is a visitor center at the airport as well as one in downtown Huntsville (500 Church Street NW, Suite One). 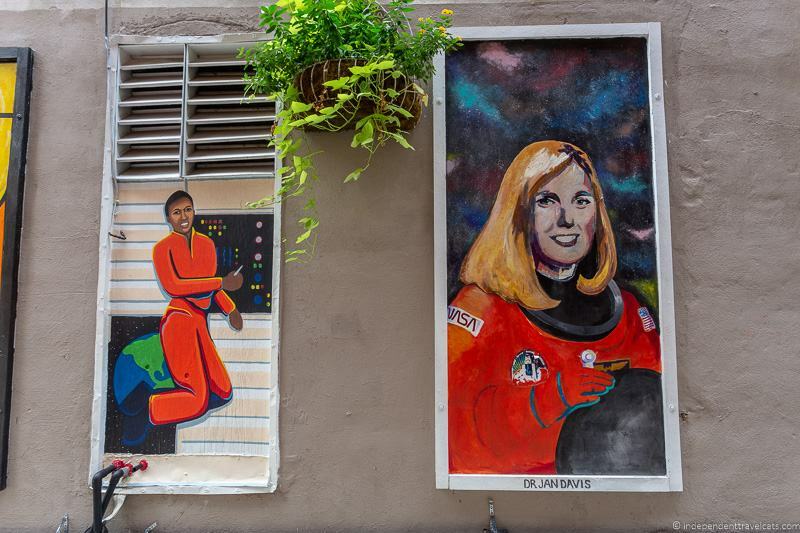 Huntsville offers something for everyone whether you are interested in art and historical homes, space and technology, or fried chicken and beer. Or some combination of them all! We did a lot in our 5 days in Huntsville and below are our favorite things to do in Huntsville. We hope this list will be useful in putting together your own custom itinerary for your time in Huntsville! The U.S. Space and Rocket Center is an educational center dedicated to space. It is the largest spaceflight museum in the world, and is the best place in the world to learn about the history of rocketry as it sits next door the NASA facility that designs and tests rockets! This is the most visited attraction in Huntsville and is one of the top attractions in Alabama. The U.S. Space and Rocket Center is divided into three main parts: The Davidson Center for Space Exploration, the main exhibit area, and the outdoor Rocket Park and Shuttle Park areas. The Davidson Center for Space Exploration is the newest main addition to the museum and its main attraction is its display of one of the 3 existing Saturn V rockets. The Saturn V is the tallest, heaviest, and most powerful rocket ever used in an operation. You can walk under this giant rocket as you visit all the many other attractions and informational exhibits here, which include training equipment, astronaut artifacts, the Apollo 16 capsule, and a moon rock from the Apollo 12 mission. The main atrium exhibit area includes information on the local history of space flight, a collection of space memorabilia, and special temporary exhibits. There is also an International Space Station module mock-up you can walk through to get a sense of sense of what it is like to live and work on the ISS. Outdoors, you’ll find a large collection of rockets and shuttles, which includes 27 missiles and rockets. The outdoor Saturn V is a full-scale replica (the real one is inside) but all the rest we believe are original. There are also several outdoor rides and simulators, which include the G-Force Simulator, Moon Shot, and a Mars climbing wall. The U.S. Space & Rocket Center also has a gift shop, an on-site cafeteria, and a domed theatre and planetarium that plays daily space-themed films. 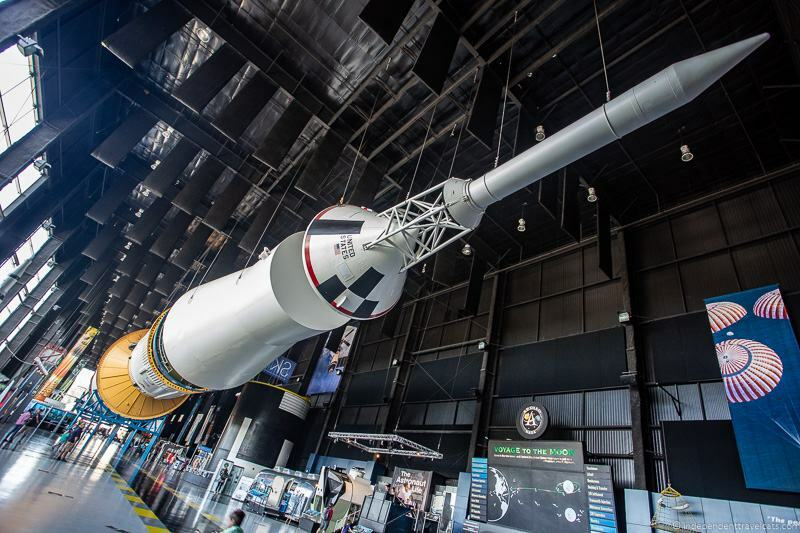 General Admission to the U.S. Space & Rocket Center provides access to historic Shuttle Park, Rocket Park and all the indoor exhibit areas including the main museum and the Davidson Center for Space Exploration. Tickets can be booked in advance or purchased on site. There is an extra cost to watch the films or planetarium shows. If you have more time, there is also the option to book a bus tour of NASA’s Marshall Space Flight Center where visitors can get a behind-the-scenes look at parts of the NASA campus. Marshall Space Flight Center is NASA’s lead center for the development of rocket propulsion systems and technologies. For example, NASA Marshall was responsible for the development of the Apollo launch vehicles that sent the first astronauts to the moon and for some of the modules for the International Space Station. The center continues to be highly involved in the development of space vehicles and scientific research for all of the major space missions. Tours vary based on operations but normally tours include seeing the Historic Test Stands, including the Redstone Test Stand, where static tests of the Juno I and Mercury Redstone Launch Vehicles were performed from 1953 to 1961. Tours also usually include the Propulsion Research and Development Laboratory and Payload Operations Integration Center. The Marshall Space Flight Center tours, because of security precautions, are only available to United States citizens with proper photo identification. These cost an additional $20 and last 2 to 2.5 hours. Tours can be booked in advance by phone or at the ticket desk at the U.S. Space and Rocket Center. You can find out more about the tours here. If you love space and NASA, you can easily spend the whole day here! For more information see our visitor guide to the Space and Rocket Center. For those of you wanting an even more “hands-on” space experience, a visit to Space Camp might be the perfect option. 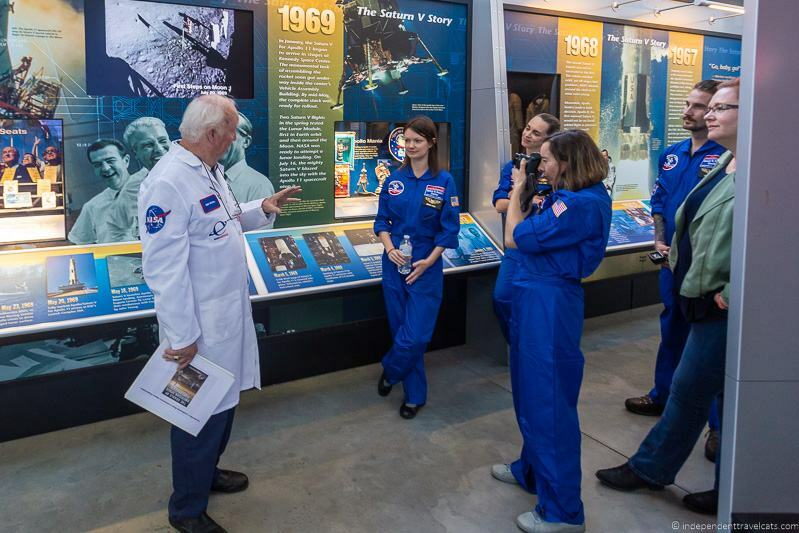 Operated by the U.S. Space and Rocket Center (and on the same location), Space Camp is a fully interactive and immersive experience, offering a range of camps that range from one day to one week. Space Camp offers a set of space-related educational experiences and simulations. In addition to being fun, these also focus on teamwork, critical thinking, and math and science learning. It offers a range of experiences that are similar to the training exercises that actual NASA astronauts do, or have done in the past. So far seven of Space Camp’s graduates have gone on to become actual astronauts! Space Camp is the main camp offered here, but there are also robotics, cyber, and aviation focused programs. They also sometimes offer other themed experiences as well. On-site lodging is available for campers. 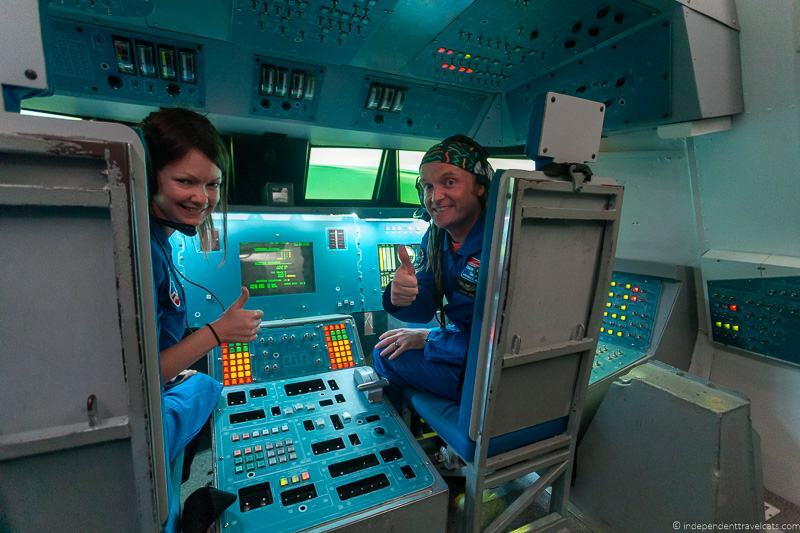 It’s hugely popular for school-age children in the United States, but Space Camp is also open to adults and families, as well as international schools and visitors. It’s a really fun experience, and definitely one to consider if you have the time. If you are interested in doing Space Camp, this is something that you will need to book well in advance. 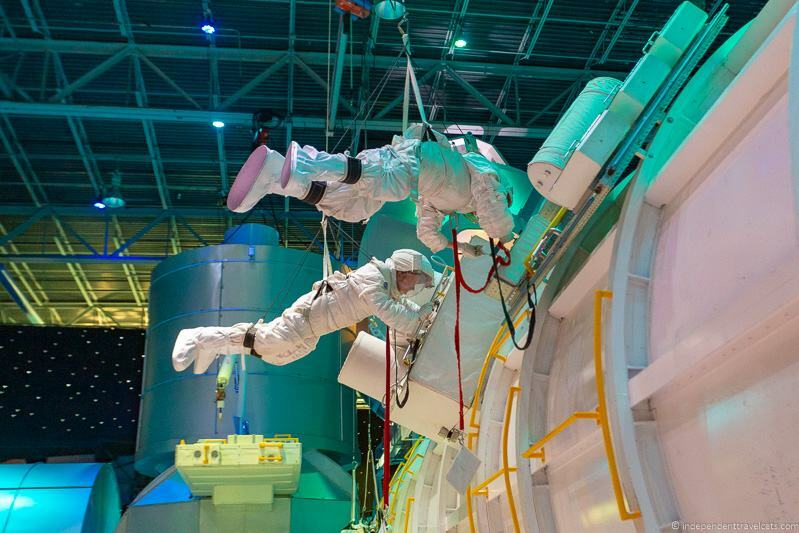 If this is a must-do in Huntsville, you’ll want to plan your trip around the Space Camp dates. You can see their current and upcoming programs here. See more about visiting Space Camp in our full Space Camp guide! Given its “Rocket City” nickname, it is probably not surprising that there are several other space-related sites in or near Huntsville. None of these are must-sees like the U.S. Space & Rocket Center, but may be of interest for those interested in space and rockets. The Hermes Guided Missile which was the first American-made guided missile ever put on public display. Located near the junction of Airport Road and Memorial Parkway near the Huntsville Airport. 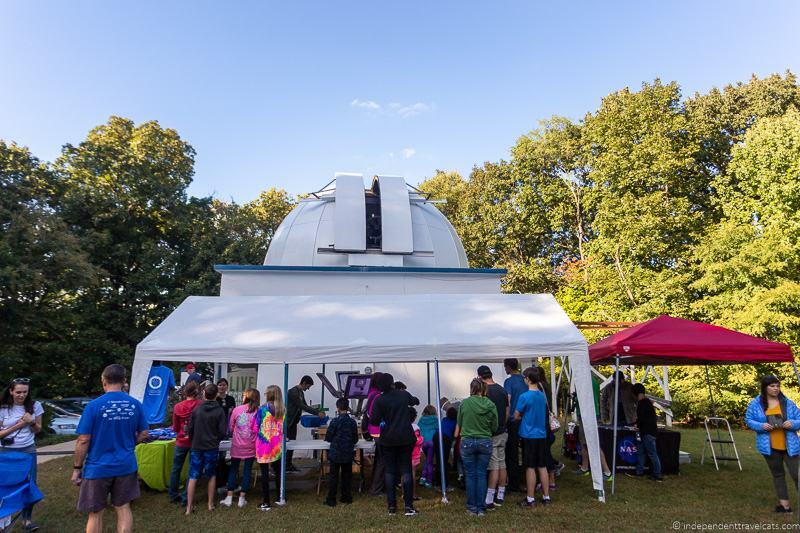 Wernher von Braun Planetarium – Planetarium and observatory run by the Von Braun Astronomical Society, which offers public shows on most Saturday nights. Located in Huntsville within the Monte Sano State Park. 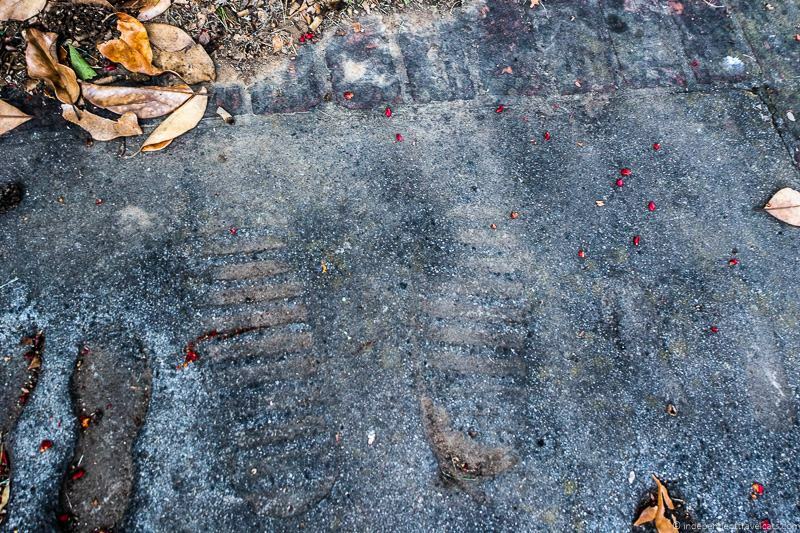 Alan Shepard Jr. bootprints – You’ll find boot prints by pilot and astronaut Alan Shepard, who was the first American in space, along Franklin Street in downtown Huntsville next to the Alabama Constitution Hall. Marker and footprints were placed here to commemorate the 25th anniversary of the Apollo Moon Landing in July 1994. Boeing Space Station Connecting Node – This Boeing built connecting node was built as a mock-up for the Space Station program and was later given to the Huntsville Botanical Garden. It now sits within the Children’s Garden section of the botanical garden. Located about 30 miles north of Huntsville in Elkmont is the Saturn 1B Launch Vehicle that was developed at the U.S. Marshall Space Flight Center. Located at the Alabama Welcome Center in Elkmont off 1-65. 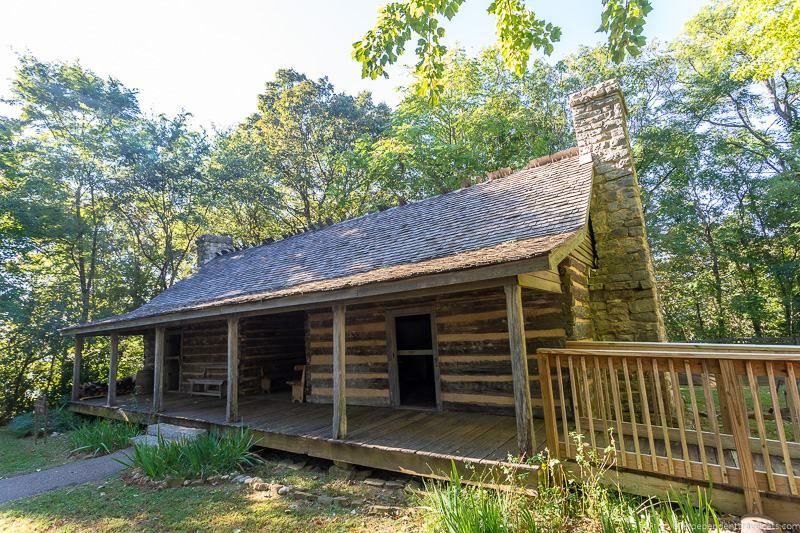 Burritt on the Mountain is an open-air museum that sits on a high plateau near Monte Santo State Park. The grounds are filled with historic 19th century properties that have been brought from all over Alabama and placed here in the interests of preservation and education. These include an 1810 log cabin, a 1884 church, a 1885 cabin, and an 1890s barn. The museum began after William Henry Burritt donated his 20th century mansion to the city upon his death in 1955 with the hope that the land could be used for a museum. Over the years, it has continued to expand with new buildings, features, and attractions. In addition to being a popular visitor attraction, the venue also hosts a number of events such as conferences, parties, and weddings. In addition to touring the buildings and mansion, visitors can also interact with the actors and guides in period-costumes in many of the buildings. The staff provide information and often demonstrate different things like weaving, woodworking, or farming chores. There is also a barnyard area with farm animals. There are also a number of activities, seminars, and workshops that are often taking place at the museum. 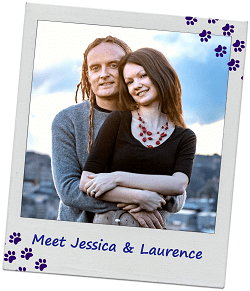 Some are free to join and others require pre-booking. 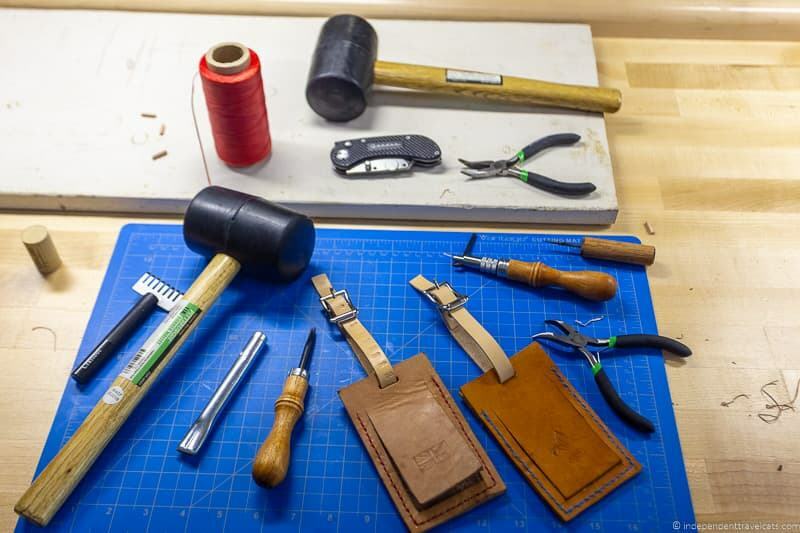 For instance, during our visit there was a leather crafting workshop in the replica 4-room Rosenwald school house, and we made leather luggage tags. It was hard work but we got to take home our finished products! These folk school workshops are organized by Burritt on the Mountain, and you can see the upcoming schedule of events here. There is a fee to visit the museum, and tickets can be purchased on site. One of the really nice things about Huntsville is how much greenery surrounds and permeates the city. Lovers of the outdoors and hiking won’t need to go very far in order to find a nice trail for either a short or long hike. Much of the land and associated hiking trails are managed by the Land Trust of North Alabama. 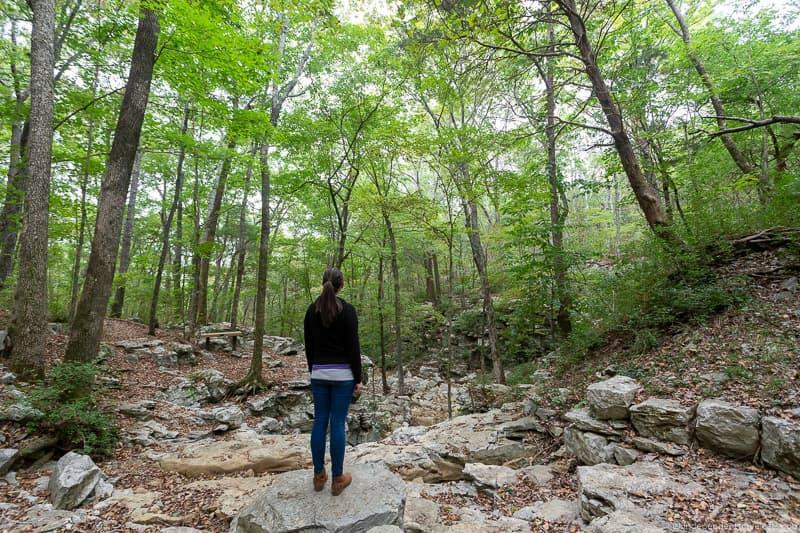 We took a hike in the Land Trust’s Monte Sano Nature Preserve, an 1,100 acre land preserve which features over 22 miles of free publicly accessible and well-marked trails. There are several popular trails here and different routes feature caves, former railway tracks, springs, and wildflowers. It’s really nice to have so much green space within the city, and we enjoyed the 1 hour long hike along the Wildflower Trail that we did here. 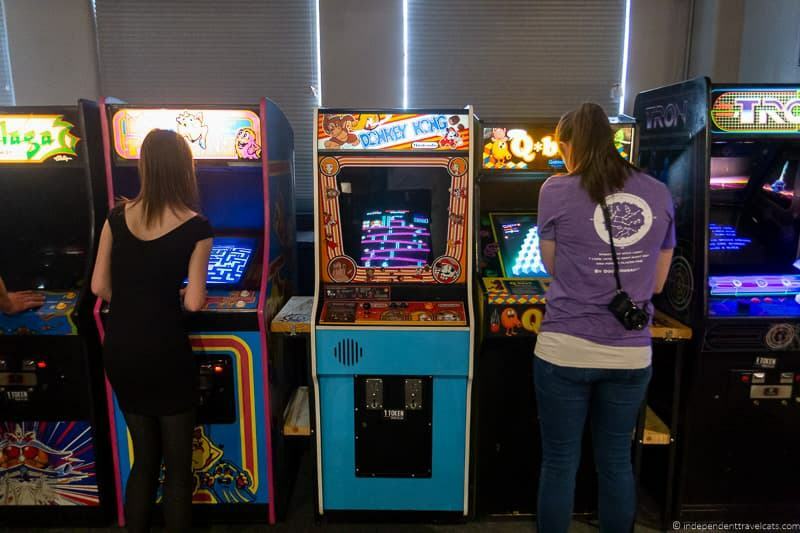 If you love old arcade games or pinball machines, Huntsville is a great place to feed that passion as there are several arcades in the city. Rocket City Arcade which offers over 70 vintage arcade and pinball games with all the classic favorites. They charge an admission fee but then you can play the games free all-day. Pints & Pixels – A casual pub-style eatery that also has 50 vintage arcade and pinball machines, including all the classics like Pac-Man, Tetris, and Mario Kart. Serves lunch and dinner, and has a full-service bar. Ronnie Raygun’s – This spot within the large Campus 805 dining and entertainment venue offers beer and lots of pinball machines. Good option for those already planning to explore Campus 805 and who love pinball. Stars & Strikes – This modern entertainment center offers bowling, an arcade, bumper cars, laser tag, escape rooms, and more. So a great place to get your arcade fix if you also want a place offering a variety of other activities. We personally stopped for our arcade fix at Pints & Pixels in downtown Huntsville, which is a great place to go if you want both a meal and a place to play arcade games. They also have a great beer list and the arcade is family-friendly. Laurence and I had a really fun time playing games like Mrs. Pac-Man, Q-Bert, Frogger, Mario Kart, Tetris, Street Fighter, and Mario Bros. Many of these were favorites of mine back when I owned an Atari and Super Nintendo! Those who enjoy gardens, may want to make a stop at the Huntsville Botanical Garden. 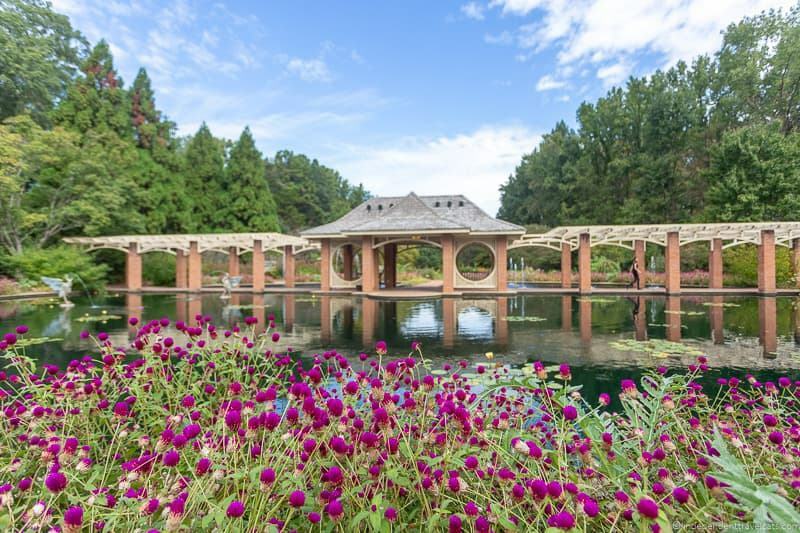 Open year round, this 112 acre garden is one of Alabama’s top visitor attractions. It has trails throughout its different zones, which include a fern glade, a daylily garden,14 themed herb gardens, a nature trail, and a children’s garden. 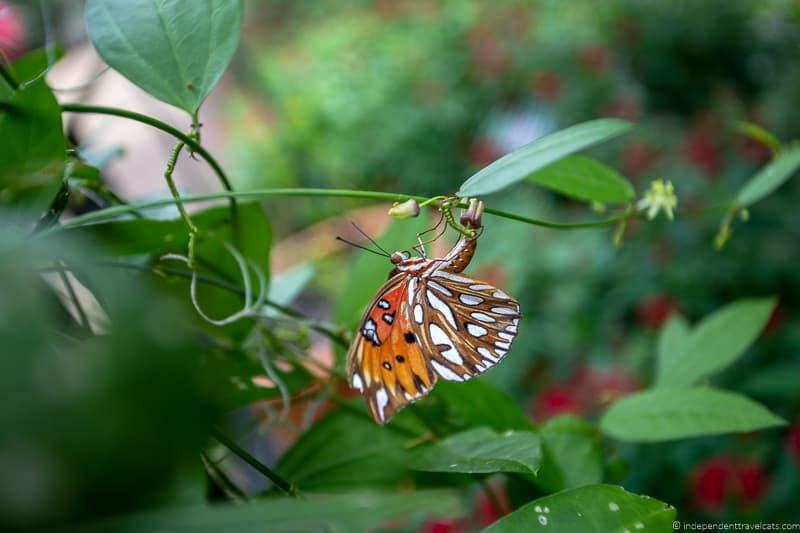 It’s also home to a large open-air seasonal butterfly house that is normally open from April to September. Birdlovers may want to follow the Lewis Birding Trail which takes visitors along the diverse areas of the garden where birds are often seen. Over 40 bird species are regular spotted in the garden each year and it is considered an important birding spot. The garden also hosts multiple themed events throughout the year. 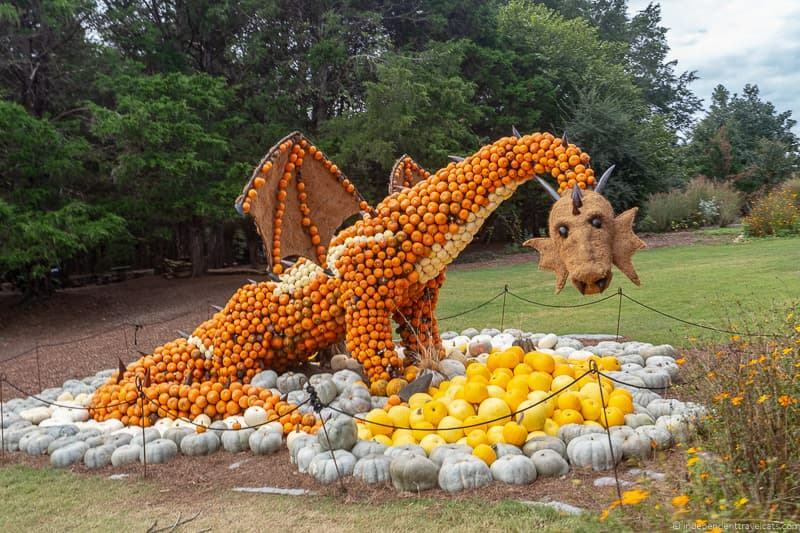 When we visited it was near to Halloween, so there were multiple pumpkin sculptures throughout the park. One of its most popular annual events is the Galaxy of Lights event. This is held through November & December each year, and features beautiful light installations throughout the garden, which can be seen either on a driving tour or walking tour. Tickets for this need to be booked in advance, which you can do here. There is also a guest center, gift shop, vending machines, and a cafe located here. Shuttles are often available for those with limited mobility, and a limited number of wheelchairs can be borrowed. There are paths throughout much of the garden. Those with reduced mobility are advised to call ahead. There is an admission fee to visit the garden, and special tickets are needed for certain special events such as the Galaxy of Lights. Like in many American cities, craft beer is popular and there are a number of craft breweries in Huntsville. However, the craft brewery revolution was late in taking off in Huntsville. This was partially due to local legal regulations (most of which have been repealed) and partially due to local tastes. But in 2004, Olde Towne Brewing Company started the first brewery in Huntsville in over 70 years! It closed in 2010, but since its closure several new breweries have opened. The oldest is Straight to Ale, which opened in 2010 and kept the craft beer scene alive. Today craft beer is thriving in Huntsville. There are several breweries in Huntsville and Madison, and likely more to come. There is a local Craft Beer Trail, that connects many of the local craft breweries and beer shops in Huntsville, and you can follow that if you want to really check out the local beer scene! We had a chance to taste beer from a few of the local breweries including Straight to Ale, Yellowhammer Brewing, and Old Black Bear. All are definitely worth trying. Laurence really enjoyed trying the IPAs at all the breweries and Jess’s favorite was the Yellowhammer flagship beer, the Belgian White. With a primary focus on 19th and 20th century American art, the Huntsville Museum of Art is a must-see location for lovers of art and culture. They have over 3,000 objects in their permanent collection, and also host regular rotating temporary exhibitions. The primary collection mainly focuses on 19th and 20th century American art but also features artwork from Europe, Asia, and Africa. 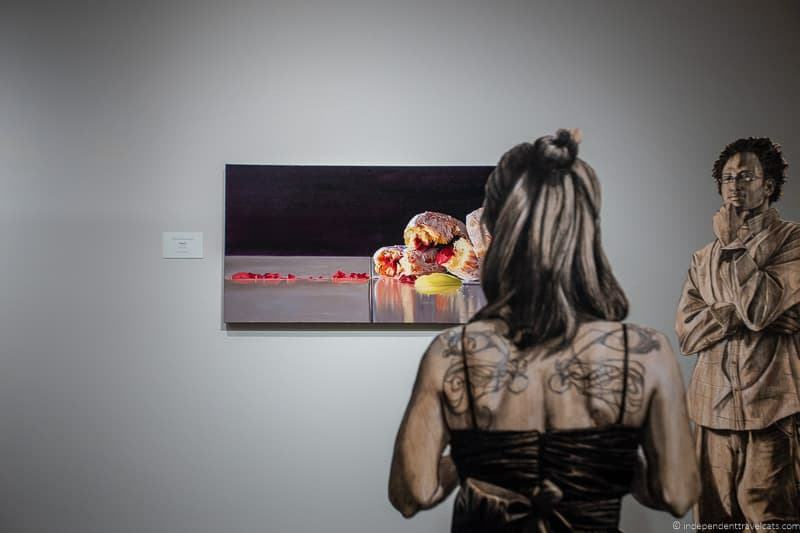 The collection includes paintings as well as artwork made of wood, glass, metal, clay and fiber. It has a particularly large number of glass and silver objects. When we visited there was a collection of aquatints, lithographs, and etchings of the flora and fauna of the New World from the museum’s collection, which included some from famous American naturalist John James Audubon. This being Huntsville, there is also a space and science vibe to some of the pieces that the museum has acquired over the years. The prime example is Moonwalk by Andy Warhol, which depicts Neil Armstrong’s photograph of Edwin “Buzz” Aldrin walking on the moon for the first time in 1969 during the Apollo 11 mission. The museum also has a collection of watercolors by Renato Moncini. Moncini worked as an illustrator for NASA in the Apollo program, and his watercolors depict scenes of both the NASA Marshall Space Flight Center and Huntsville itself. The museum also has a gift shop and restaurant. If you are hungry after taking in all the art, you might want to stop in for pizza or pasta at the casual Italian restaurant Pane e Vino. Open daily for lunch and dinner. There is an admission fee to visit the museum. Free cell phone audio tours are available, and private and group guided tours can be arranged in advance. 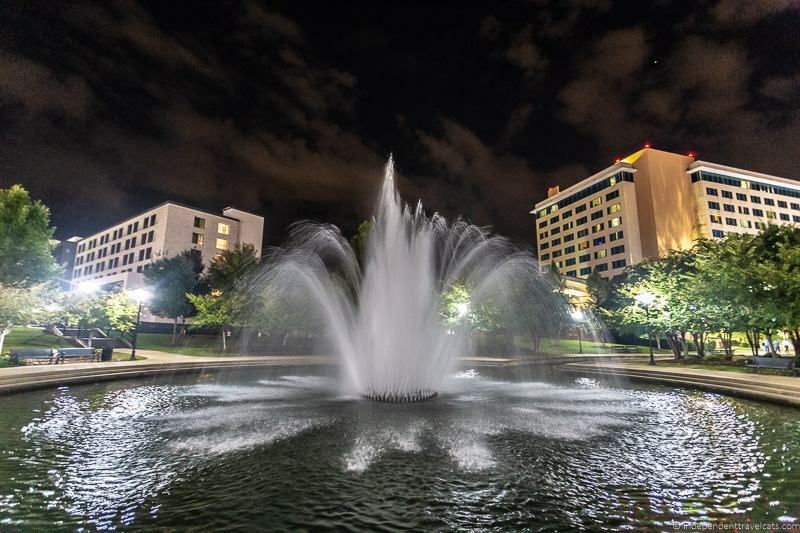 Big Spring International Park is the most popular park in downtown Huntsville. Its history is older than the town itself as the Big Spring, a huge underground spring, is next to where Huntsville founder John Hunt first settled back in 1805. The town would slowly grow outward from here. Big Spring is a huge water source and canals were even built here. In fact, the Big Spring would serve as the city’s main water supply source until the 1960’s. Over time the park has expanded to encompass more area. Today, the park is a popular place for walkers, joggers, and families. It contains a lagoon and sections of the canal which are home to ducks, geese, and koi. The park also features gifts that were given to the city from foreign nationals, including a light beacon and fog bell from Norway and a red bridge and cherry trees from Japan. The Big Spring Park is also the site for a number of events throughout the year, including the Panoply Arts Festival, which is one of the largest arts events in the Southeast. Concerts, plays, and holiday events are also held here. A seasonal outdoor ice skating rink is set up next to the park during the winter months. The Big Spring Park is located adjacent to the Huntsville Museum of Art, so makes a great place to take a stroll before or after a visit to the museum. 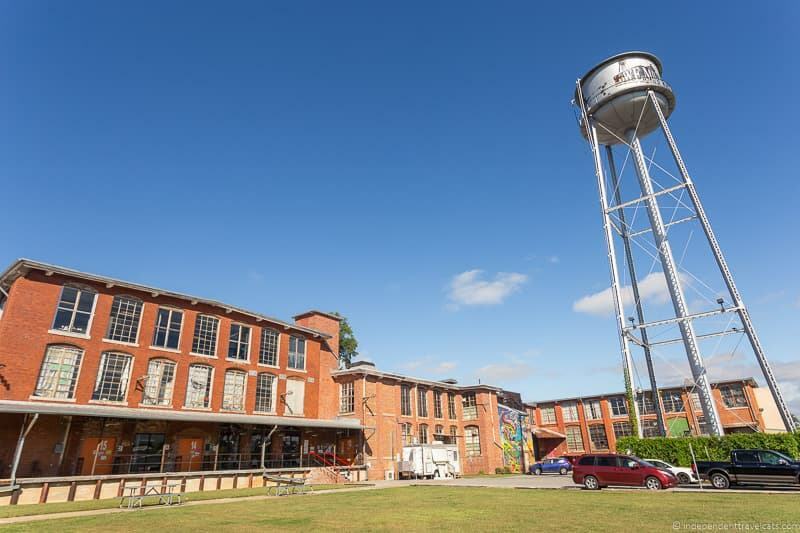 If you enjoy art, crafts, and unique handmade items, we recommend you head to Lowe Mill Arts & Entertainment. This is a massive former cotton mill that has been redeveloped into what is now the largest privately owned arts facility in the USA. There are over 100 working artists studios in the building across its 171,000 square foot space, as well as restaurants, performance venues, and several fine art galleries. This is a fantastic place to come and meet local artists, who cover pretty much every medium and type of art you might think of from paintings to printwork to pottery to bronze sculptures. 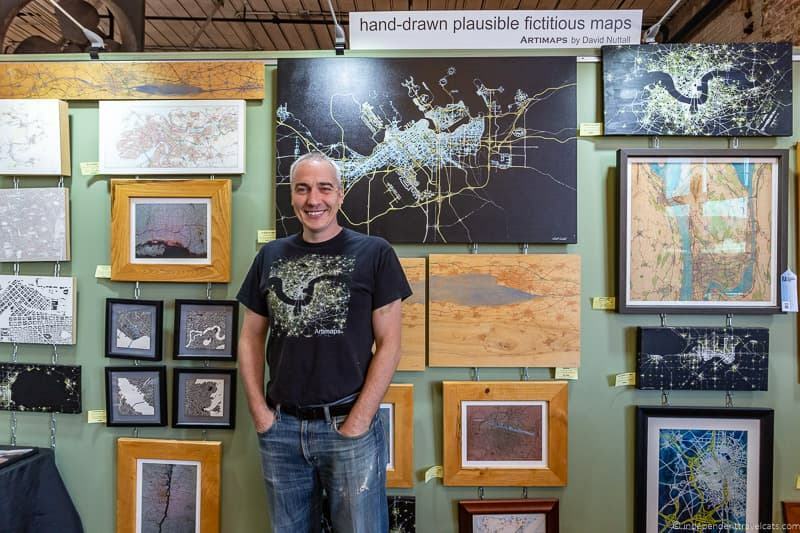 We particularly enjoyed meeting artist David Nuttall of Artimaps, who creates entirely realistic but also entirely fictional maps of locations he imagines in his head. Imagining maps is something he has been doing since he was six years old, and it’s incredible to see the level of detail that goes into each of his maps. We liked his work so much that we purchased one of his maps to take back home! Of course you can find more than just art at Lowe Mill, you’ll find stores selling vintage clothing, records, jewelry, art supplies, and more. You can also sign up for a number of classes and workshops, which range from make-up tutorials to painting to digital art to baking gingerbread cookies. There are also a number of food business and restaurants, including a tea shop and distillery. We had lunch at Happy Tummy which is a great stop for sandwiches and wraps. 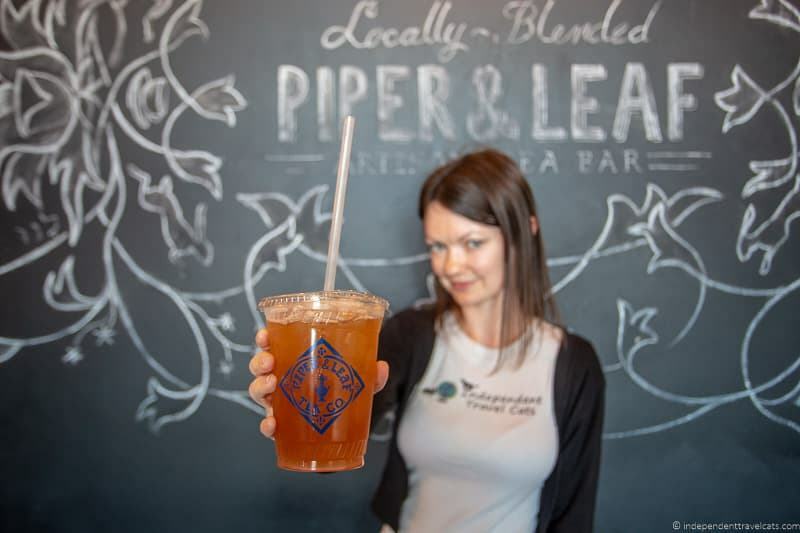 We also had tea at Piper & Leaf which is a local family-run company that blends its own tea. They sell prepared tea (hot or cold) as well as bags of their black and green teas. We really enjoyed their black tea blends. When you think of a fun activity for a group of friends to do in the evening, I’m guessing the chances are that axe throwing is going to be at the top of your mind. Especially if you are a lumberjack! Urban ax throwing is a rapidly growing activity, where participants throw small axes at wooden targets. Sort of like darts with axes, or a gun range with axes. Huntsville is home to a number of venues that will let you hurl an axe at a wooden target. 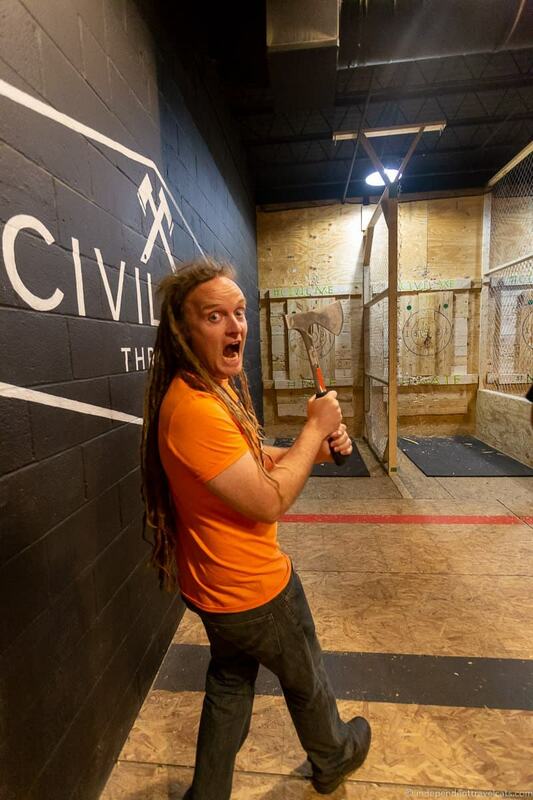 These include Rockaxe City and Civil Axe Throwing. We visited the Civil Axe Throwing venue in Campus 805, where we learnt all about the art of ax throwing. It turned out to be more difficult than you might imagine and our group missed the target more than they hit it. To be honest, this is not my cup of tea, but Laurence had a lot of fun and was very proud of the couple of times he hit the target! Axe throwing can be popular, especially on Friday nights and weekends, so we recommend booking in advance. Works the same way as reserving a bowling lane and sessions are using 30 minutes or 60 minutes in length. You’ll need to sign a waiver to participate and must be at least 18 years of age. 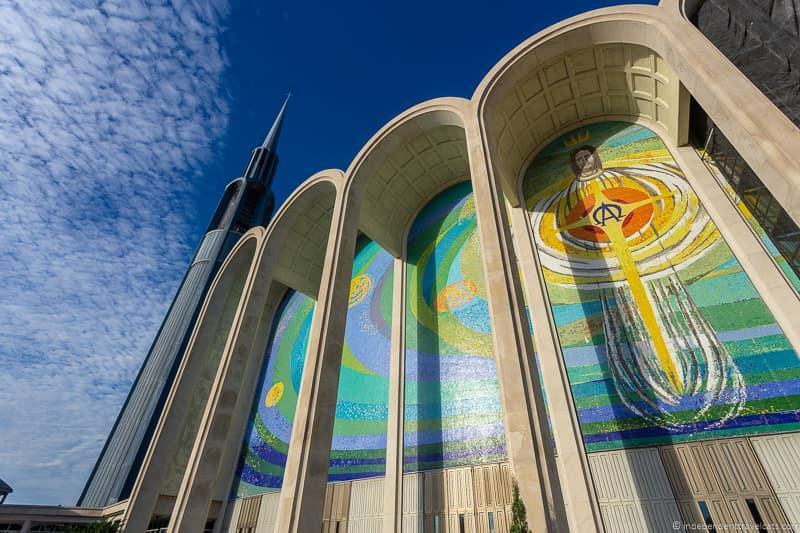 Cosmic Christ is a large mosaic that adorns the facade of the sanctuary of the First Baptist Church located on Governors Drive. The mosaic is a local landmark and is hard to miss being 47 feet high and 157 long and constructed of over 1.4 million glass tiles. The mosaic was created by artist Gordon Smith and it is designed to express the Biblical theme “Creation and Redemption”. Although formally known as “Cosmic Christ”, many locals affectionately refer to it as “Eggbeater Jesus” because of the resemblance of the lower part of the Jesus figure to an eggbeater. It does indeed resemble an eggbeater or whisk. The Cosmic Christ mosaic took 7 years to complete (1966-1973), but sadly was not properly designed or installed and many of the glass tiles have come off the wall. A massive restoration process is in the works, started in 2017, that will replace the existing tiles while keeping the same overall design. Over 6 million Italian hand-blown pieces of glass will be used to replace the existing mosaic over the next 5 years. The final mosaic will have more color and definition when completed! Although the mosaic is probably the best known part of the church for visitors, the church itself is the oldest missionary Baptist church in Alabama. Its history of worship dates back to 1809 and the first meeting house was established in 1813. It is still an active church with regular worship services, and you can find out more here. The current building dates to the 1960’s (although it had a huge renovation in 2012) and you can see it has many space-related elements that would have appealed to the “Space Race” generation, including the stained glass windows, mosaic, and 229 foot rocket-like carillon bell tower. If you have a chance to go inside the church, you’ll find beautiful stained glass windows in both the sanctuary and baptistery. These windows look beautiful in morning sunlight. They represent the creation of the universe and have a very space related look to them with planets, galaxies, and stars. While there is no particular food that is specific to Huntsville, the city serves up all of the Alabama favorites. Alabama’s cuisine is very Southern and there is an emphasis on fried food. Portions tend to be large and are often big enough to share. 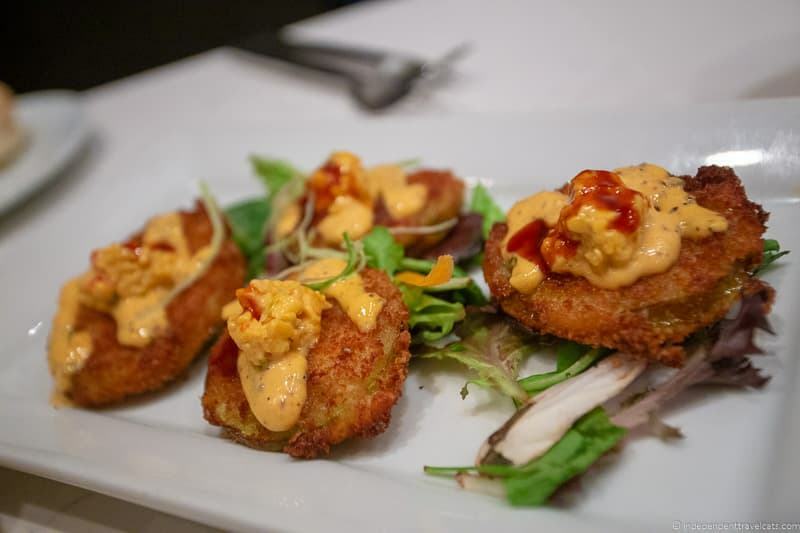 Some common foods you may want to try in Huntsville (and elsewhere in Alabama) include fried catfish, BBQ pork, fried chicken, pimento cheese, cornbread, shrimp and grits, fried green tomatoes, fried pickles, banana pudding, and pecan pie. Of course you’ll also find all types of cuisines in Huntsville, not just Southern, including Italian, Japanese, Chinese, Greek, German, Thai, Mexican, etc. Huntsville offers up a variety of eateries from fast casual to fine dining. A few of the unique venues include the geek-themed Toy Box Bistro and the Blue Bayou which is a restored train carriage turned restaurant. See our list of recommend restaurants (most are places which we ate while in Huntsville) in our earlier Where to Eat in Huntsville section. Huntsville has 3 historic districts (so far): Twickenham, Old Town, and Five Points. These are all adjacent to each other and great areas to explore for those who enjoy historic homes and have an interest in architecture. Building styles are varied in these areas, and you’ll find Federal, Queen Anne, Gothic Revival, Greek Revival, Italianate, Victorian, Bungalow, Cape Code, and Ranch style homes. Although most of the homes are closed to the public and can only been seen from the sidewalks, the Thomas Weeden House in the Twickenham District is open to the public. 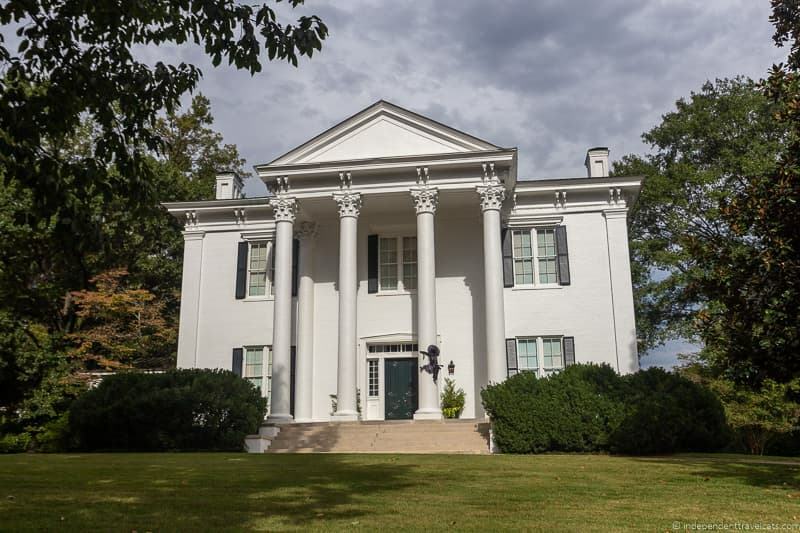 The Weeden house was built in 1819 in the Federal style and is one of the most notable historic homes in Huntsville. Check out the Weeden House Museum for the latest information about opening hours. However, there are more than just homes. 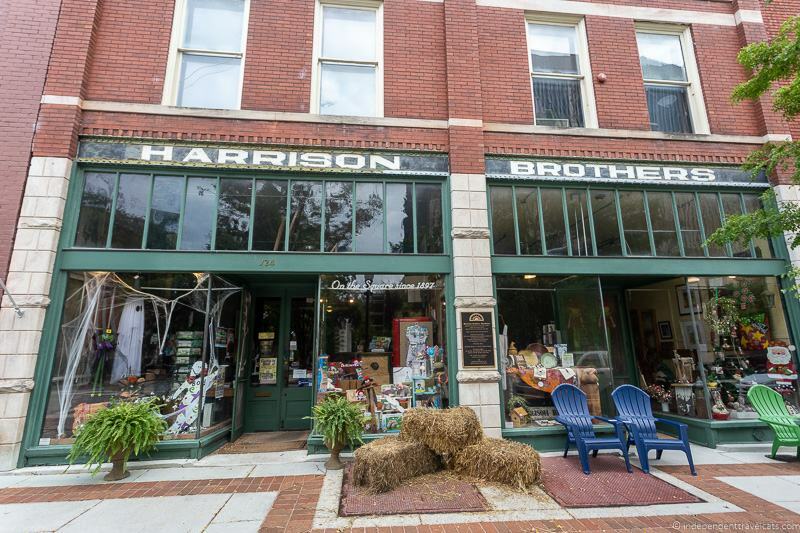 There is also the Harrison Brothers Hardware, which sits on the edge of the Twickenham Historic District and is a great place to stop and shop. It sells homeware, toys, crafts, art, local food items, gifts, and seasonal goods. It first opened in 1879 (been located on the Square since 1897) and is one of the oldest businesses in Alabama. There is also the Episcopal Church of the Nativity, built in 1859 and designed by British architect Frank Wills. It is built in the Gothic Revival style and is considered one of the best Gothic structures of this type in the Southeastern United States. 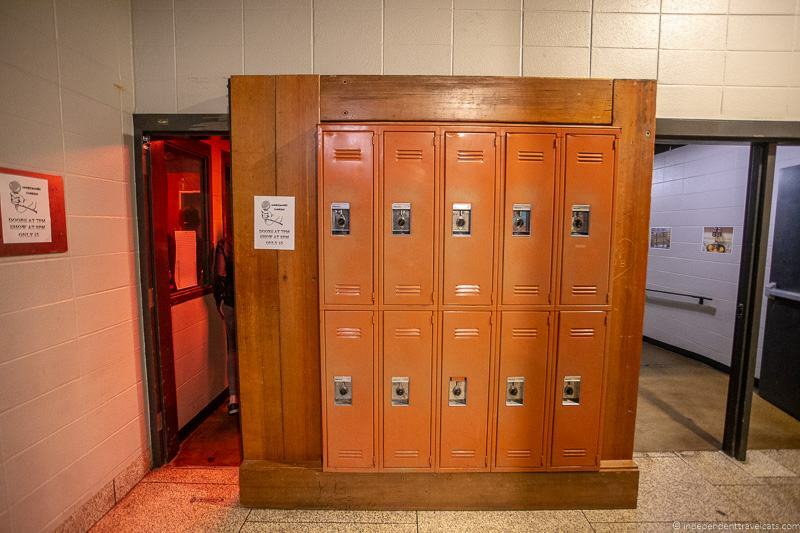 It is now a National Historic Landmark. The three historic districts are all adjacent to one another so it’s easy to put together your own self-guided walking tour using this excellent detailed audio guide and map. You can also join one of the free guided history walking tours that are offered each month through the convention bureau. There are also seasonal trolley tours, and you can purchase tickets for these from the EarlyWorks Museum. In addition to regular history walking tours in the months of September and October, there are also guided evening ghost walking tours of these historical areas as well as haunted trolley rides for those who prefer a touch of the supernatural. Check out Huntsville Ghost Walks for times, info, and costs. Twickenham was the first area of Huntsville that was designated as a historic district. Twickenham was the original name of Huntsville (named after a town in England) and was given the name by LeRoy Pope, the “Father of Huntsville”. It was later renamed after the Revolutionary War hero and first settler John Hunt. Twickenham contains many of the largest and most upscale homes in the city. 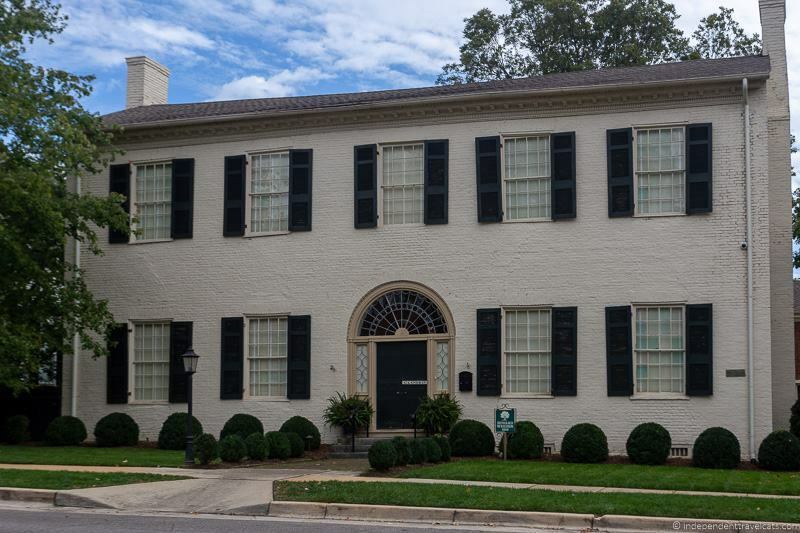 Most of the homes date from the 19th century, particularly from the antebellum period, and include a number of the dominant architectural styles from this period including Federal, Queen Anne, Gothic Revival, Greek Revival, Italianate, and Bungalow. LeRoy Pope House, (403 Echols Avenue SE) – known as the Poplar Grove estate, the hilltop mansion and plantation was built by “Father of Huntsville” LeRoy Pope. This was the first mansion built in Huntsville in 1814, and it was greatly extended over the years. In May 1814, Pope hosted a large public dinner on the lawn for General Andrew Jackson and soldiers returning from the Battle of Horseshoe Bend. Thomas Weeden House (300 Gates Avenue SE) – built in 1819 in the Federal style, one of the most notable residents was the artist and poet Maria Howard Weeden. Open to the public as a house museum. Albert Erskine House – built in 1818 (or perhaps earlier) in Federal style, porch and south half of house were added on later. The blue glass in the windows is interesting. Moore-Rhett House (603 Adams Street SE) – 2-storey Neoclassical Revival-style house. First built in 1826 for newspaper editor John Boardman but later rebuilt in 1850s by John Boardman. Later owned by Sam Moore who was known for his prize-winning Jersey milk cow Lily Flagg. Thomas Bibb House (300 Williams Avenue SE) – built in 1836, this was originally a Federal home that was later converted into Greek Revival. Owned by Alabama’s second governor Thomas Bibb. Fletcher-Lowe House (210 Williams Avenue SE) – built around 1903, one of the “newer” homes, built in the Chateauesque Revival style. Helion Lodge #1 (409 Lincoln Street) – Site of the first masonic lodge in Alabama. The group received the charter in 1811 and the first building was erected in 1820. Early members include John Hunt and LeRoy Pope. If you love historic homes, and only have time to see a few, I’d recommend strolling through this district. The Old Town was designated as a historic district in 1974. The Old Town contains buildings that mostly follow right after the period of the homes built within the Twickenham Historic District, with most of them dating from the late 19th century to 1930. The main architectural styles of the homes here are Victorian, Federal, Bungalow, American Craftsman, Colonial Revival, and Prairie School. You’ll also find the Providence Classical School (formerly the East Clinton School) in this area, which is one of the few remaining examples of Art Deco architecture in Huntsville. Five Points was designated a historic district in 1999. Five Points has mainly been a middle class and working-class neighborhood and so unlike the other two historic districts, has less grand homes. This area was likely Huntsville’s first suburb and you can see many homes built between the 1920’s to the 1960’s. Prominent architectural styles include Victorian, Craftsman style, Cape Code, and Ranch style. 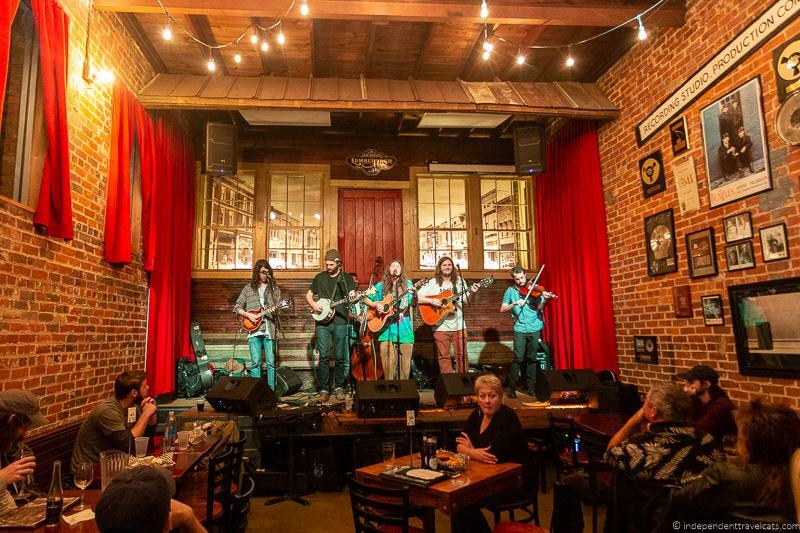 If you enjoy unique, eclectic, and rambling venues, you have got to check out AM Booth’s Lumberyard in downtown Huntsville. It is a dining and entertainment venue that features live music, bars, dining areas, and large outdoor spaces. This sprawling venue is set in a former Lumberyard (hence the name) near the railway, and features a variety of spaces to choose from for relaxing in, as well as live music across multiple stages and indoor and outdoor dining options. There are multiple bars in the venue. When we visited, they had only recently opened the Blue Bayou dining experience. Set in a lovingly restored 1924 Pullman train carriage, this offers excellent value family-style dining and a very unique experience. 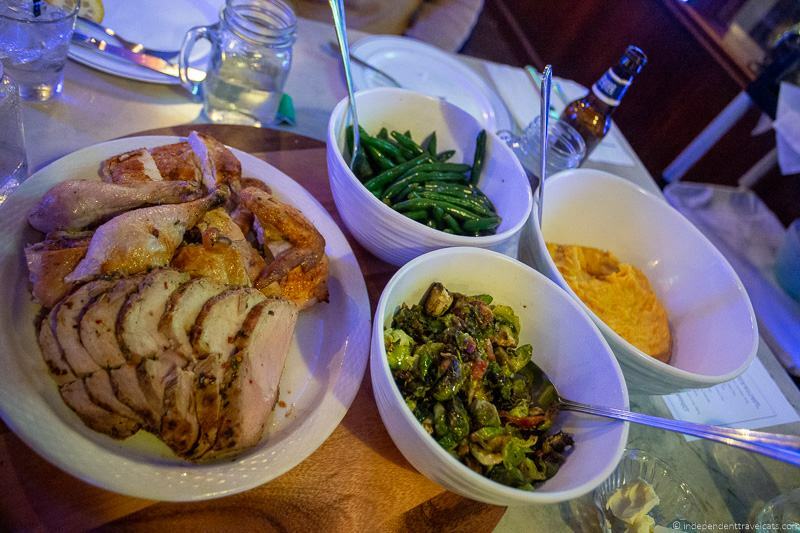 Each of the booths hold 6 persons and the 3-course meal is served family style. We loved the Southern homestyle food and opportunity to meet and chat with some of Huntsville’s local people. If interested, be sure to book this in advance. When you visit AM Booth’s Lumberyard, you’ll want to take the opportunity to play the world’s largest working jukebox before you leave. 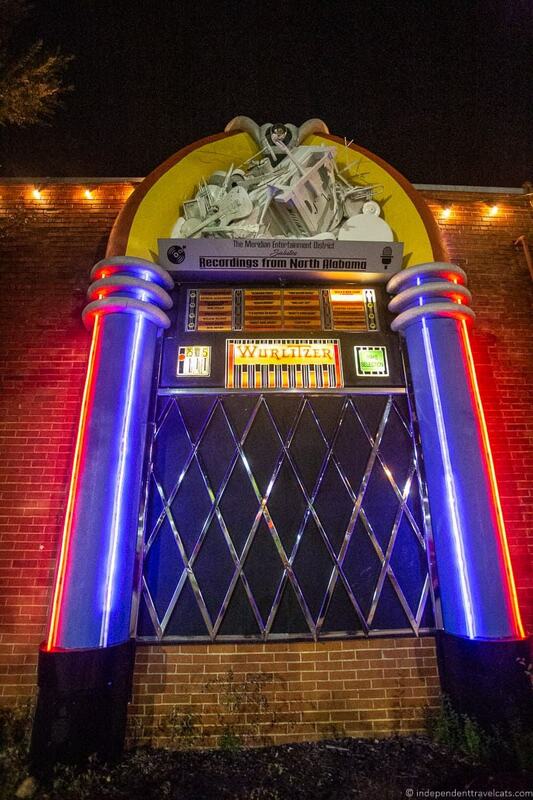 This 22 foot tall Wurlitzer jukebox was built into the wall outside the Lumberyard and Doug Smith’s Sound Cell recording studio, at the corner of Cleveland Avenue and Meridian Street. When you stand on the street in front of the jukebox, an infrared sensor will recognize you are there. Your presence will trigger a song to play at random (there are a number of North Alabama songs), and it will burst into life. 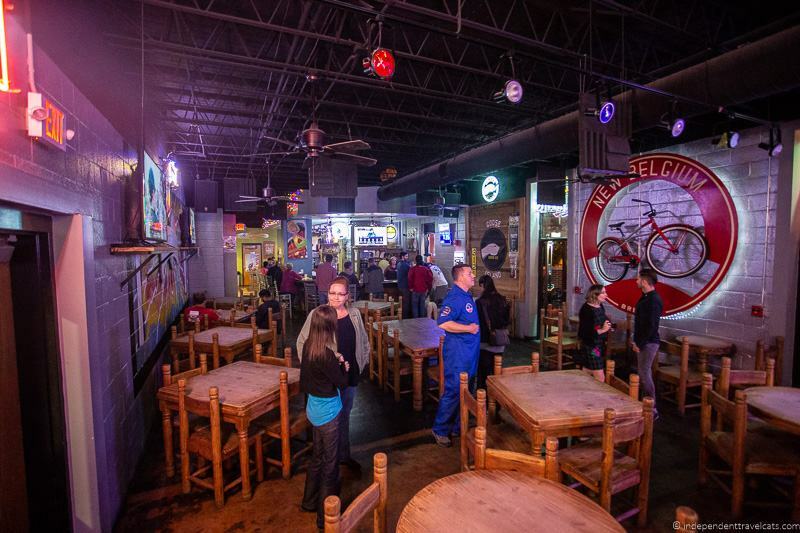 Campus 805 is another one of Huntsville’s eclectic dining and entertainment spaces. The main building is a former school building that served as a school from 1951 to 2009, first as S.R. Butler High School and later as Roy L. Stone Middle School. The middle school closed in 2009 and the giant space has since been turned into Campus 805. Campus 805 is large and consists of 2 main buildings. The venue includes restaurants, breweries, shops, a speakeasy, an arcade, axe throwing, art classes, a golf simulator, and more! We had pizza at Earth and Stone Pizza which is popular eatery owned by a local husband-and-wife team. A great place for pizza as well as ice cream and local Yellowhammer craft beer. We did axe throwing at Civil Axe Throwing and had beer from Straight to Ale. We also wandered around to take a peek at the speakeasy, see a ballroom dancing class, visit a pinball arcade, and see a group of people painting and drinking wine in a Spirited Art class. Before you visit check out the events and business directory to see what is there and what is happening. If you have an interest in history, you may want to visit the Earlyworks Museum Complex. The Earlyworks Museum Complex is a set of three history-related museums in downtown Huntsville: the Alabama Constitution Village, EarlyWorks Children’s History Museum, and Historic Huntsville Depot and Museum. The EarlyWorks Museum Complex also hosts a number of local events and private functions. It is home to the popular annual Santa Village in Huntsville each December, which is a local holiday tradition for many. The Alabama Constitution Village and Children’s History Museum are a short walk from each other. The Huntsville Depot is located a 15 minute walk (or a 3 minute drive) from the other two museums. Each site charges an admission, and tickets are available to purchase at each museum. Currently (as of November 2018), if you visit the Huntsville Visitor information Center, you can grab discount coupons, including 20% off coupons to either EarlyWorks Children’s History Museum or the Historic Huntsville Depot. 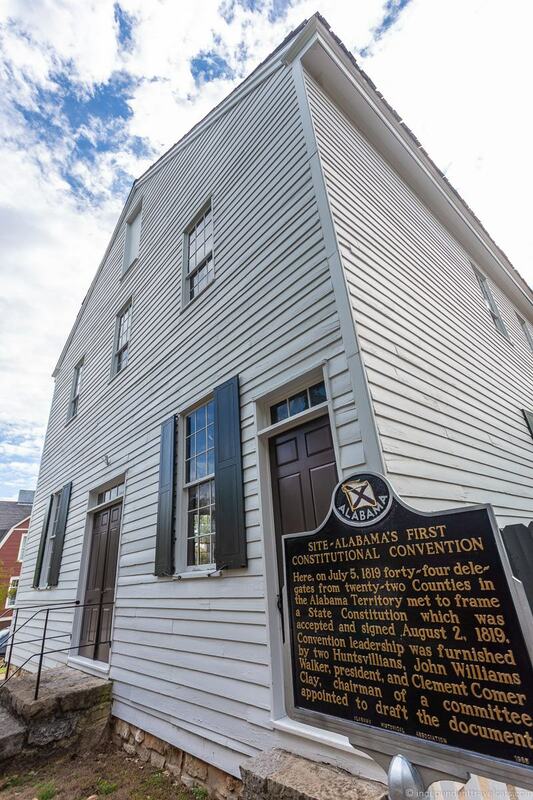 Huntsville was selected as the site of the first state Constitutional Convention, and here 44 delegates met in a vacant cabinet shop to decide on the new state’s constitution. Alabama became the 22nd state on December 14, 1819, and the delegates would meet in Huntsville from July 5, 1819 to August 2, 1819. Fun Fact: The current Alabama state constitution, adopted in 1901, is the longest operative constitution in the world at 310,296 words! Huntsville served as the temporary state capital from 1819 to 1820, before it moved to Cahaba, and eventually to where it is today in Montgomery. Today, the site is the Constitution Hall Park, also known as the Alabama Constitution Village. It is a historical open-air museum that brings to life the early nineteenth century as it would have been around 1819. The buildings, which are mostly historical replicas, include a print shop, law office, confectionary shop, post office, cabinetmaker’s shop, and residence. Within the site, actors in period costumes enact 19th century daily life and customs through demonstrations and hands-on educational programs. These include demonstrations of a printing press, blacksmithing, woodworking, sewing, and baking. Note: The Alabama Constitution Village is currently undergoing restoration to prepare for Alabama’s Bicentennial in 2019 and it is closed until March 2019. The EarlyWorks Children’s History Museum is a great place for young children and families. It features a number of interactive areas, games, play areas, and even has a talking tree that provides history stories to children. There is also a replica General Store and an area that allows kids to dress up in 1800’s period clothing. Open year-round. The Huntsville Depot and Museum is a local railway museum that is located at the Huntsville railroad depot, which is the oldest surviving depot in Alabama and one of the oldest in the country. It was built in 1860 and served as the eastern headquarters for the Memphis and Charleston Railroad. It was captured and used by the Union Army as a temporary prison during the Civil War. The depot was in active use until 1968. The train depot offers a number of exhibits about train travel and local transport as well as some outdoor exhibits. The museum has a small collection of vehicles including a fire engine, antique cars, a steam engine, and a train caboose. Tour guides are often available to take visitors on a guided tour. Gift shop offers train and Civil War related memorabilia. For those interested in trains, we’d also recommend considering make a stop at the North Alabama Railroad Museum, located about 6 miles north of Huntsville in Chase, AL. This museums includes a restored train depot, library, over 30 major pieces of rolling stock, and working trains. Admission is free although there is a charge for train rides and donations are appreciated. 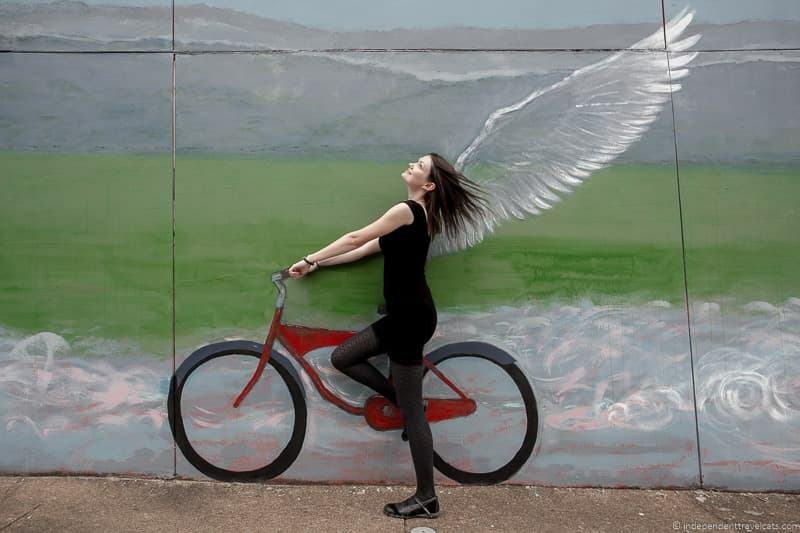 If your prefer your art outdoors rather than indoors, Huntsville still has you covered. The city is filled with public art, and new public art works regular pop up in the downtown area. Some pieces are permanent and others are temporary. 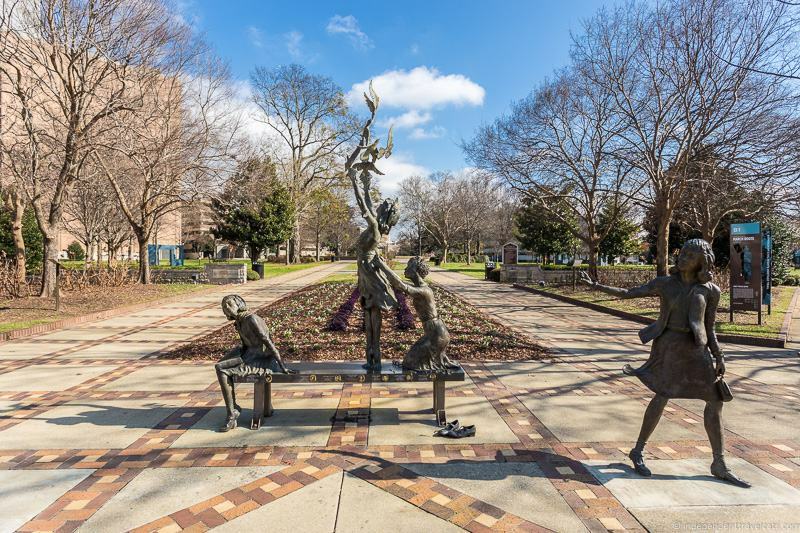 One of the largest public art projects in Huntsville has been the SPACES Sculpture Trail which runs through the city and features over 35 sculptures by over 20 artists from across the United States. The city regularly organizes guided local walks of the trail, but you can easily see the sculptures on your own. If you enjoy street art, there are some fantastic street art murals around the city. 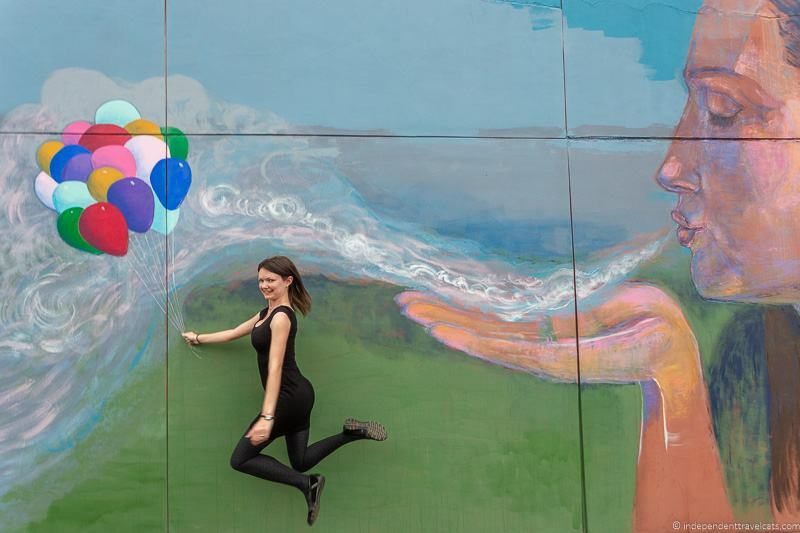 Some are designed to encourage you to get involved in the piece, perhaps by holding an errant bunch of balloons or being eaten by a giant carp. A couple of good spots to find street art in Huntsville are the Clinton Row Color Walk and the murals around Big Spring Park. Of course, you’ll likely spot art all over Huntsville if you keep your eyes peeled. Some other examples include the famous Cosmic Christ mosaic on the side of the First Baptist Church, the painted mural on the side of the Liquor Express building, the murals on the exterior of the Lowe Mill ARTS & Entertainment buildings, and the mosaic mural inside the Madison County Courthouse. Although Huntsville is not necessarily known for its happening nightlife, there is still a lot to do in the Rocket City in the evening. These range from going to a bar for live music to seeing a film at the local cinema to going to the ballet. Huntsville is home to its own symphony orchestra, a professional ballet company, and theatre companies. Check out what is happening during your visit at the Von Braun Center. This large space is often used to host theatre, ballet, symphonies, festivals, and concerts. If you’d rather drink a beer than watch the ballet, consider checking out some of the local craft breweries and bars, see the local craft beer trail. Many bars offer live music in the evenings, especially on Friday and Saturday nights. 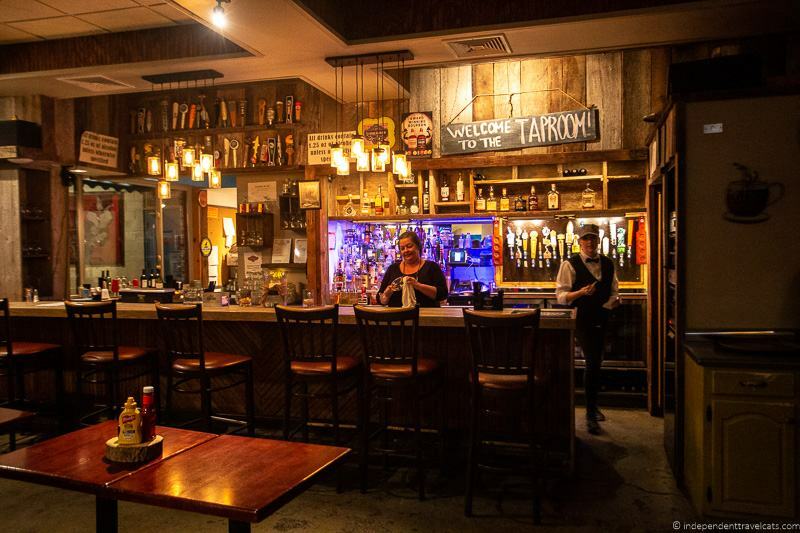 AM Booth’s Lumberyard has live entertainment on most evenings. You might also want to head over to Campus 805 as this venue offers bars, axe throwing, restaurants, a pinball arcade, and much more! Or grab some wine and pick up a paintbrush at a Spirited Art class. Looking for something else? Take the family out for bowling and/or arcade games, there are several options in Huntsville. Or catch a film at one of Huntsville’s cinemas. Or see a planetarium show at the Wernher von Braun Planetarium—the planetarium and observatory offers public shows on most Saturday nights. Don’t forget to check for special events and seasonal offerings as well. For example, during the months of November and December, consider heading to the Galaxy of Lights event at the Huntsville Botanical Garden. The Panoply Arts Festival takes place in April, which offers all day events. In October, there are ghost walks and haunted trolley rides of the downtown areas and historical districts. During December there is Santa’s Village and lots of other holiday events. If you have more time in the city and have covered all the attractions in Huntsville, you may be looking for some day trip ideas. All of the following are located within a 2 hour drive of Huntsville. Some can also be reached by bus, for instance both Chattanooga and Birmingham can be reached by Greyhound bus from Huntsville. 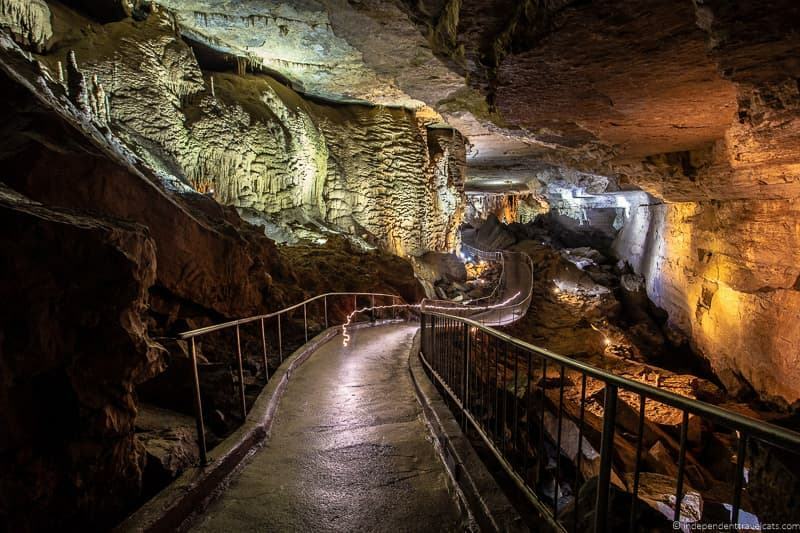 Cathedral Caverns State Park – Operating as a tourist attraction since the 1950’s, this massive cavern features what is believed to be the world’s largest entrance to a commercial cave as well as one of the largest known stalagmites in the world. It offers guided tours and has about 2 miles of accessible concrete paths. Located in Woodville, AL, about 30 miles from Huntsville. 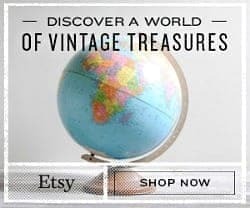 Unclaimed Baggage Center – A giant unique shopping attraction that offers clothing, jewelry, accessories, shoes, travel gear, and other goods found in unclaimed baggage! The center also offers visitors the chance to open a piece of unclaimed baggage themselves each afternoon. Opened in 1970, this is now one of Alabama’s top tourist attractions. Located about 40 miles from Huntsville in Scottsboro, Alabama. Jack Daniels Distillery – This famous whiskey distillery offers visitors the chance to learn about the history of American’s best-selling and most famous whisky and its creator, how the whisky is made, and of course taste it. A variety of tours are offered that last from 30 minutes to 3 hours. Located in Lynchburg, Tennessee, about 50 miles from Huntsville. Bankhead National Forest – One of Alabama’s 4 national forests, it is a popular place for hiking, fishing, swimming, camping, canoeing, hunting, bird watching, boating, and horseback riding. The 181,230 acre forest contains lots of trails, waterfalls, and even petroglyphs. Located about 60 miles from Huntsville. Noccalula Falls Park – A large public park with paved trails, a Pioneer Village, petting zoo, miniature train, picnic areas, a playground, mini-golf (seasonal), and a covered bridge. The park’s main scenic attraction is Noccalula Falls, a beautiful 90 foot waterfall. There is also a campground that offers camping, recreational activities, and a swimming pool. Perfect place for families, as well as those looking for paved walking/running trails. Located near Gadsden, AL, about 72 miles from Huntsville. Chattanooga – A city of about 200,000 people, the city offers museums, family attractions, scenic outdoor spots, a scenic riverfront area, and more. Some popular attractions include Ruby Falls, Rocky City Gardens, LookOut Mountain Incline Railway, Tennessee Aquarium, and the Hunter Museum of American Art. Check out the official tourism website for more info. Chattanooga is in southeastern Tennessee and is about 100 miles from Huntsville. Birmingham – A city of over 200,000 people in north central Alabama that was founded following the Civil War. Some popular attractions include the Birmingham Museum of Art, Birmingham Civil Rights Institute, Sloss Furnaces National Historic Landmark, Kelly Ingram Park, Birmingham Botanical Gardens, Alabama Splash Adventure, Red Mountain Park, and the McWane Science Center. Check out the city’s official tourism website for more info. Birmingham is located about 100 miles from Huntsville. If you are planning to travel throughout the Southeastern United States, you might want to check out this South road trip itinerary for ideas further afield. 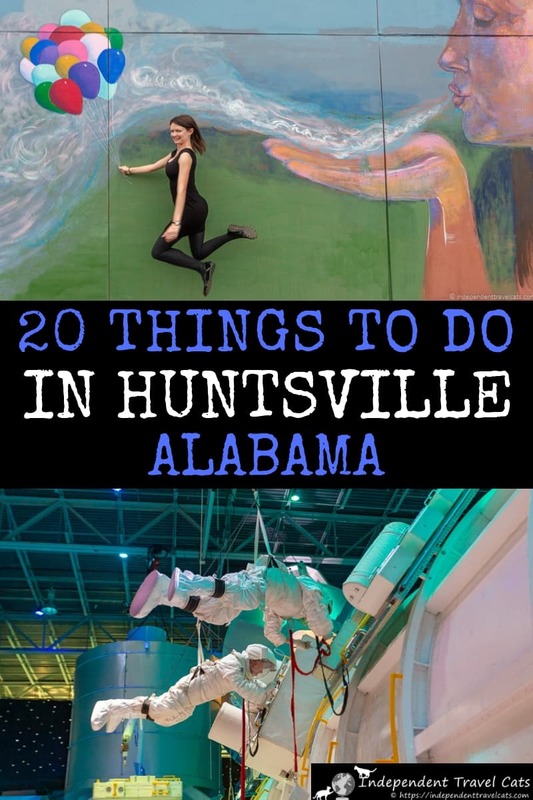 So that’s our travel guide and list of the top things to do in Huntsville Alabama! Have you visited Huntsville Alabama? If so, what were your favorite things to do in Huntsville? As always, we’d love to hear your thoughts, and are happy to answer any questions you may have about visiting Huntsville or anywhere else in Alabama. We love hearing from you and you can ask any questions in the Comments section below. You did an amazing job covering my hometown. It’s been years since I’ve been there, but this post here brought back good ol’ memories. Been nomading and living by the beach for the past 10 years, but there’s always a moment when you realize that it’s time to go home! So glad I stumbled upon your site. I thoroughly enjoyed your article on Huntsville, AL. It was very informative and interesting. I live in south Alabama but will be attending a week long conference in Huntsville, next month. 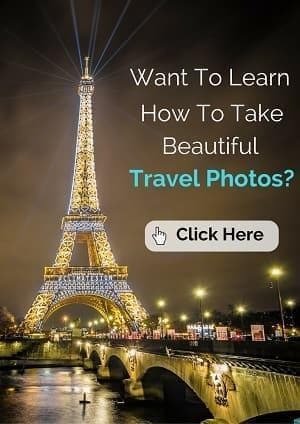 After reading your article, I’ll be extending my trip so I can visit some of these interesting and beautiful places. Thank you so much for what you do. I can’t wait to visit more places based upon your recommendations. Excellent article. Thanks for shining a bright light on Huntsville. *The link to Capitol Theatre says it is in Canada. I’m not aware of one with that name in Huntsville, AL. Is there another theater that you intended to say? Glad you enjoyed our article on things to do in Huntsville! Oh, yes, that link was for a cinema in the wrong Huntsville – fixed, thanks for the catch! This is a very comprehensive guide to Huntsville. I didn’t realize you could have so much fun in this city. My sister used to go there quite often for work, but she didn’t really like Huntsville. I had no idea there was so much to do in Huntsville. I remember passing through as a kid on a road trip and that’s about it. Definitely think I need to go back. Also, love the photos of you with the street art. I’ve never been to Alabama, so excuse me for being surprised that there are so many thing to do in Huntsville alone! Sounds like a lot of culture as well as a food/drink scene. Thanks for sharing! Hey, you are over on my side of the pond:) I’ve never been to Huntsville, but there are definitely some great things to see here. One of my best friends sent her son to Space Camp and he had an amazing time. It really is a special opportunity. I’ve done some caving.. I like large ones like Cathedral where you don’t have to crawl through but can walk on a wooden walkway and just enjoy the unique beauty. The botanical gardens is looking very appealing to me as I look at at snow. However, if you haven’t been, the New York Botanical Gardens has an amazing train show during the holiday season! Hi Seana, Yes, we spent about 4 weeks in the USA in September/October this year with stops in Texas, New Mexico, and Alabama. We spent 5 days exploring Huntsville – it has a lot going on for such a small city. Laurence was attracted by the space-related attractions and the U.S. Space and Rocket Center and Space Camp got us there. But I enjoyed the museums, gardens, and unique art and dining venues a lot. Yes, Cathedral Caves is a really nice cave and an easy half-day trip from Huntsville. I haven’t been to the New York Botanical Gardens but would love to see the gardens and NYC around the holidays – love trains!